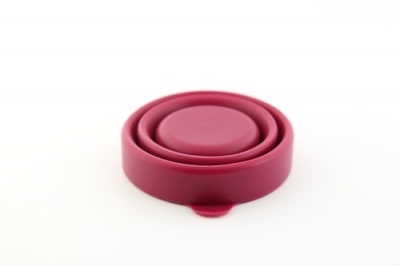 Foldable disinfection cup for your a menstrual cup of every size. 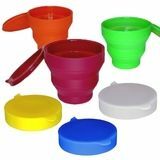 Closable, space-saving foldable disinfection cup for your MeLuna or other menstrual cup of every size. Made from food safe, microwavable silicone. Can also be used as drinking cup during outdoor activities. How do I use the disinfection cup? Please place your MeLuna into the disinfection cup and fill it up with water. The MeLuna has to start swimming. The correct wattage settings depend on your microwave model. The water must be boiling for the disinfection to be effective. If in doubt, please consider your microwave manual. Most customers use medium power level / wattage for 3 - 5 minutes. The cup's lid must not be completely sealed: otherwise the steam produced by the boiling water cannot escape. 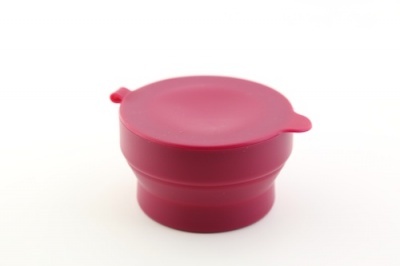 very soft and pliable cup, great for sterilising when on the move, travelling or instead of a mug/old tupperware or saucepan. I would like it to be more sturdy as it's quite precarious when filled with hot water but that would make it fold up less easy! lovely colour too, the perfect accessory to a colourful cup!